A French court has found International Monetary Fund chief Christine Lagarde guilty of negligence but did not hand down any punishment. As French finance minister in 2008, she approved an award of €404m ($429m; £340m) to businessman Bernard Tapie for the disputed sale of a firm. Ms Lagarde, who always denied wrongdoing, was not present in court, having left France for Washington. The IMF board will meet on Monday to consider the latest developments. Meanwhile, the French government said it still had confidence in the IMF chief. 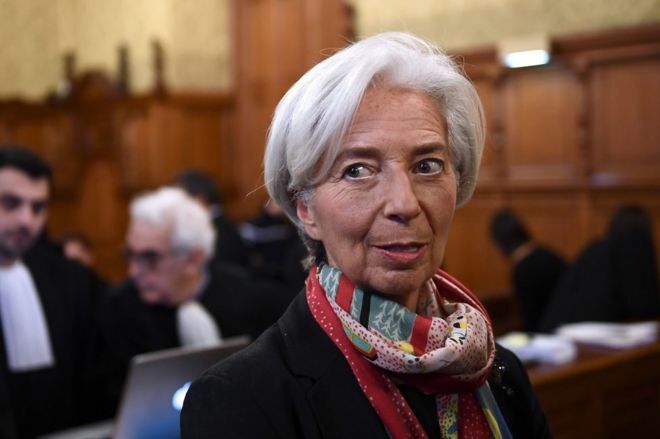 On Friday, Ms Lagarde told the trial she had always acted in good faith and the suspicion she had lived under for the past five years had been an "ordeal".